This thread is for all members that has not made contributions to the wiki of awesomeness or members who just joined the site. Please introduce yourself we wanna know who you are. Where do you come from? What is your country? What do you work with? How did you became a fan of Summer Glau? What do you admire most about her? What was the first show you saw her in? For new members I can recommend this thread to share your beautiful pictures of Summer Glau with us. Notice that the security code will be removed once you make a contribution to the site. My name is Goran, I am from Sweden, I am 33 have a M.Sc in theoretical physics, and I worked with engineering projects. I admire Summer because she is a very talented actress. I first saw her in TSCC it is my favorite show and I was really devastated when the show was canceled. I have seen the show several times and I never get bored by it. When TSCC went on a hiatus I googled for Summer Glau and read that she was famous for Firefly/Serenity I took the opportunity to watch it and loved it. We wanna be your friend. Married, have daughter 9 yars old . Never think im that much sentimental, but season 2 of TSCC really changed my feelings. Summer Glau best actress i ever seen in my life ,especially in this gehre. I Shemonaev Vladimir from Volgograd, Russia. I am 27 years old, received a degree in "history teacher", but never in the specialty has not worked. Now I work in a slaughterhouse as a loader, single. "What do you admire most about her?" - What can I say - I'm her big fan, but I do not want to analyze his zeal. Also I might add that I am a fan of Warhammer 40,000 with years of experience. Introducing oneself doesn't mean decline your civil identity, a username is enough. As Charley_Dixon said not long ago, separating the online and the real identity is better on most cases. Though we have the great chance not to have had any trolling problem here so far thank to Fermi and Charley. As Charley_Dixon said not long ago, separating the online and the real identity is better on most cases. Yep, I've said that So my real name is not Charley Dixon (obviously), but I'm fine when you just call me Charley. There are some other things I can tell you about my real life. I graduated from the department of Physics in one of the world's top 100 universities. I found a job as a programmer and eventually ended up working in IT department in a large company, so I'm usually busy. That's why sometimes I may not post for a long time, but I visit this site every day. Also as a professional IT worker I like to solve technical problems and if I see a post that addresses technical issues I usually reply immediately even if I'm very busy. Geographically I'm located in Eastern USA. I do not have accounts on Twitter, Facebook, LinkedIn, and all those modern sites. Actually I do not understand what's the point of that "social networking" thing and why people prefer them to good old forums. So this site and the red wiki ( sarahconnorfans.com ) are the only places in the Internet where you can find me. It all started in summer or fall 2007 when I first saw TSCC clips on Youtube and I just could not miss the show. I lurked on the red wiki since the first days of TSCC but I did not join it until mid-2009 - a few months after the show was canceled. I do not have a TV and I have seen relatively small number of TV shows in my entire life. The movies I saw and enjoyed in recent years (in no particular order): "Soul Surfer", "Inception", "The Blind Side", "Gran Torino", "How to Train Your Dragon", "Serenity", "The Lake House". My favorite singer is Taylor Swift. Also I like Hayley Westenra. I do not have any genre preference and I can listen anything from opera to "Rammstein" as long as I like it. Guessing the name of my favorite actress is left as an exercise for the reader. Joe73, this is your turn, don't be shy! You just have to repeat what you said on the PM you send me. I Just noticed that Thread, so i will say something about me. Where do you come from? What is your country? Rome, Italy, i live near the Aqueducts's Park in a calm part of the city. 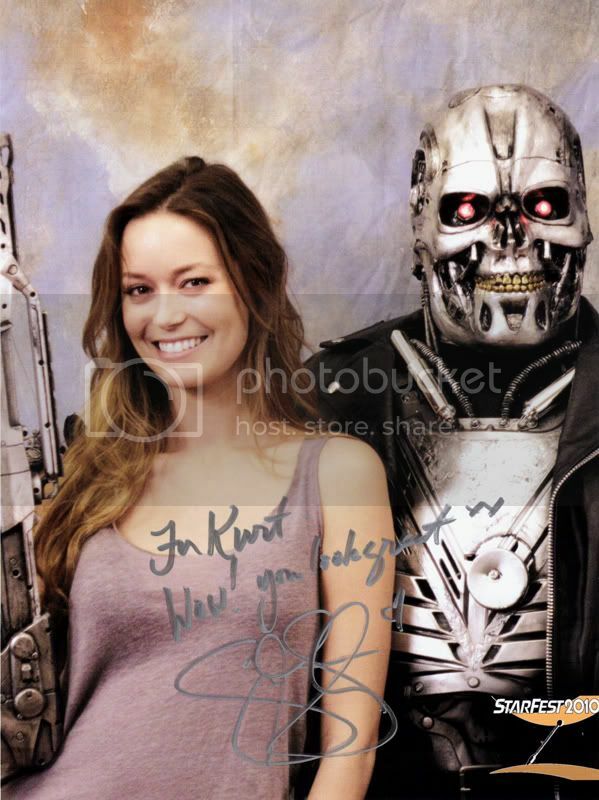 How did you became a fan of Summer Glau? Well, first time i had see her performance, i've said to me "shes pretty talented, also if isnt my type. Then since i was attracted by her acting, more than her beauty, i've start to search for her telefilms and other roles. The single one didnt appeal me so much was her in Dollhouse, but all other performance were so good and ispired me for my future works. Well first of all, her way of actinc, and her Shyness...i almost fall from my chair the first time i've see her smiling...wasnt prepared! Then i respect her way of living...ya know, she is secretive, make a lot of charity, love animal, has try to be vegetarian, didnt make part of that chaotic Hollywood world and is in her way, e perfect and pure creature. And also, with time, i become more used to her face and found she IS indeed a cute girl, one that can be easly loved by people. What was the first show you saw her in? The Sarah Connor Chronicles. I was searching about some cool telefilm to see, someting like Terminatar and after have rewatched Terminator 1,2,3 and Salvation, i hitted on TSCC by chance. At first glance that small girl didnt attracted me much, but after 2-3 episode i was litterally "falled in love" for that character. Strange enought, i'm not in love for Summer, just for 3 of here character o.o''' but i guess i'm a bit unusual as person, so is fine. Ah yes...i'm almost 33 years old, speak Italian, English, French, Croatian also if not perfectly, i'm silge by some months [since i've spend the last 7 years with 3 different girls and at the end i was bored with nothing in common with any of them] and not-in-search anymore. What more...oh yes, i'm also a photographer and i love Cosplay. I have a little website on internet but i'm not working more on it since i'm a bit Bored with that kind of stuff and i have now my new Society to work for. Even if you've been here for a few days, it's never too late to welcomme you to the wiki. You could not have known, not your fault. But i bumped this thread on purpose for our two new members. You indeed did a great job for this forum. I found your work very very laudable. I have been visiting this site for a 4-5 months now, and I finally decided to join as a member. Summer is relatively new to me. Is saw TSCC for the first time in November 2010, and I was hooked form episode 1 :D.
Since then I have seen everyting Summer Glau I could get my hands on. At first I was drawn to her character as Cameron, but then I got to know the actor behind, and realized She was not like any other Hollywood star I knew. I can't explain what it is about her I like, I guess it is that special aura that surround her. I guess you know what I mean. I earn a living as a technical designer / consultant / teacher / supporter, all in the same job. I think this is nice to learn some about the newcomers; of course you're free to apply Charley's Law by separating your personal and online identity. What strikes me is that a majority have had the same experience when it comes to Summer.